I backed the RasP.iO InsPiRing in April 2017 on Kickstarter. It’s a system of RGB LED boards using APA1O2C / SK9822 LEDs by Alex Eames. The InsPiRing was available as a stick with eight LEDs, a triangle with 24 LEDs or circle with 24 LEDs. I backed the circle insPiRing because I’d always liked the look of the neopixel rings from Adafruit. It’s a 10cm diameter circle. It came with a pHAT-sized driver board for the Raspberry Pi which makes it nice and easy to start with. There’s a small amount of soldering involved. You need to solder the header onto the pHAT and also solder the IC (an integrated circuit from Texas Instruments) (a quadruple bus buffer gates with three-states outputs) and two four-pin headers. The ring joins with the pHAT by four wires. Just plug it in and power up the Pi, in my case I have it attached to a Raspberry Pi Zero W. The code is available on GitHub at github.com/raspitv/raspio-inspiring . Just download this on to your Pi into a folder, and it includes the Apa.py class and some basic examples. 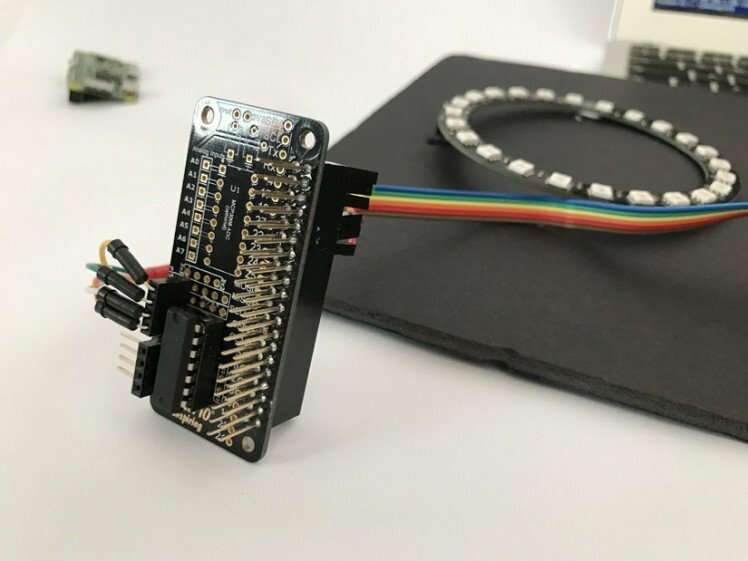 The LEDs are controlled using SPI (Serial Peripheral Interface) and Alex has included a Python class for Raspberry Pi use which makes it simple to use out of the box. I had assembled mine, but then it sat in my ‘to be finished’ project pile for a couple of months. 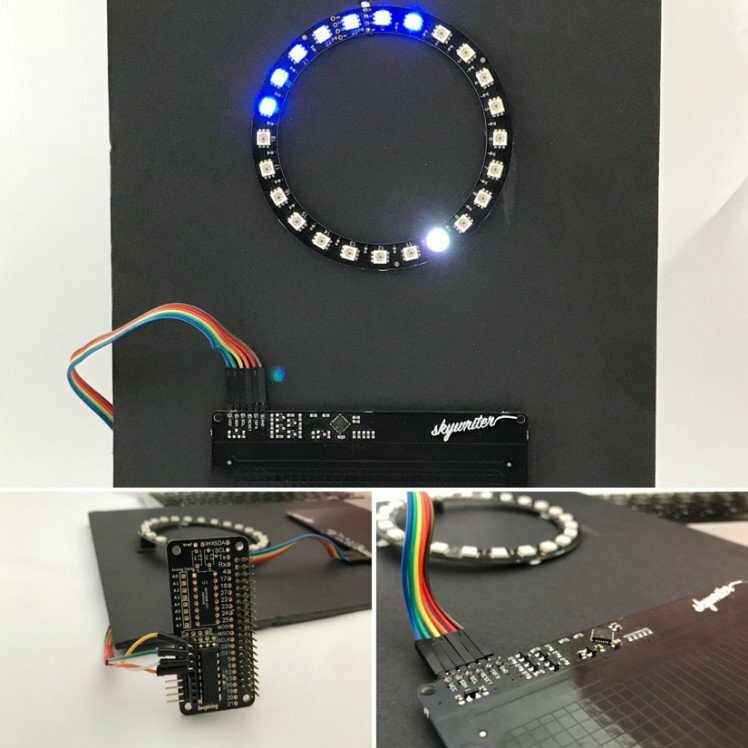 Recently I heard someone at work say about making an electronic wheel of fortune with an LED ring and as I had one sat at home already built I thought I’d give it a go at the weekend. To get started I thought I’d better make a single point of light travel around the ring, lighting each LED in sequence. I created a for loop to figure out how to make the pointer spin. This was fairly simple to achieve with just five lines of code in the for loop. The next task was getting it to stop on a designated point, which would later become the winning or losing position, rather than the zero position. At the moment this would be a chosen number, say six for this example. I changed the number of LEDs to six on the last loop, so within my spin for loop, I created an if statement. If it’s on the last spin, I set the number of LEDs to six. This has the desired effect of stopping on the 6th LED but then, very importantly, I have to reset the number of LEDs to 24 inside the while loop to make sure that the next spin starts off with full rotations. Unless you want to get into game fixing the program needs to randomly generate numbers. The Random module for Python does this with additional functions to allow for an element of control. First of all we need to import Random module at the top of our script. I created 3 variables: spin, winningnumbers and losingnumbers, the latter two being Python lists. I then defined a function called selectwinner(spin) with one parameter being spin. It chooses either a winner or loser based on modulo of a number equalling zero. Using the formula if spin % 10 == 0: would result in a winner every 10 spins. However, obviously, I need it to be impossible to predict when a winner will be chosen. So rather than a static number of 10, the script selects a random number between nine and 11. This ensures randomness but it will average out to one in every 10 wins. These numbers can be adjusted to increase/decrease randomness or increase/decrease the chance of a winner being chosen. An interesting thing to point out is that the script first chooses whether it is a winning or losing spin. Only then does it select at random the number from the python list defined with winning and losing numbers. This is particularly useful for easily changing the winning and losing numbers at the top of the script. The function returns a python dictionary - this enables me to return multiple values to use. At this stage I’m just returning numleds - the chosen number. Later I add in a LED colour value for winner or loser. Next, I wanted the LED animation to look like a natural spin. This required two things; randomising the number of rotations in a spin between a maximum and minimum number defined at the top of the script and adding a decay into the loop that increases the time for each iteration, so the spin slows down logarithmically. I use the equation rotation/decay to give a time delay. The time delay increases after each LED and increases for each rotation. This double factor gives a logarithmic scale. If the number of rotations in the spin is 10 and the ring has 24 LEDs, then the decay equals 240. This creates a logarithmic scale that starts very fast and ends slow, looking very natural. The jump in time on each rotation isn’t apparent when viewed. I’ve called the full script ring.py, it has a while True loop that runs forever with a five-second delay between each spin. For a real-world application, this can easily be replaced with a button press to set off a spin. 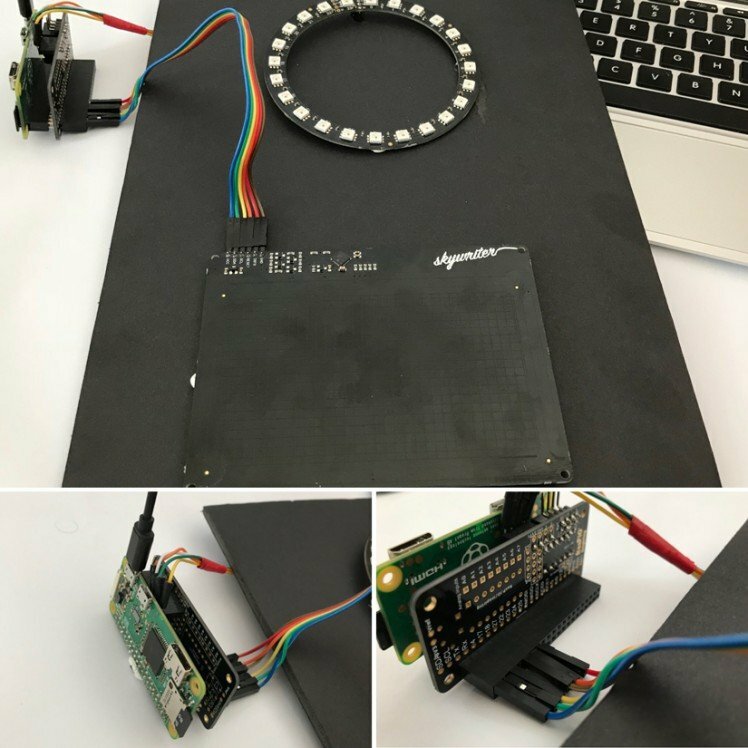 This effectively completes the wheel of fortune but to push it a bit further and make it more fun for users I added a touchless swipe to set the spin going using a Pimoroni Skywriter. The Skywriter adds 3D gesture sensing by detecting positional data (x, y, z) and common gestures like flick left, tap, and double tap. It is incredibly sensitive and can sense gestures from up to 10cm away. 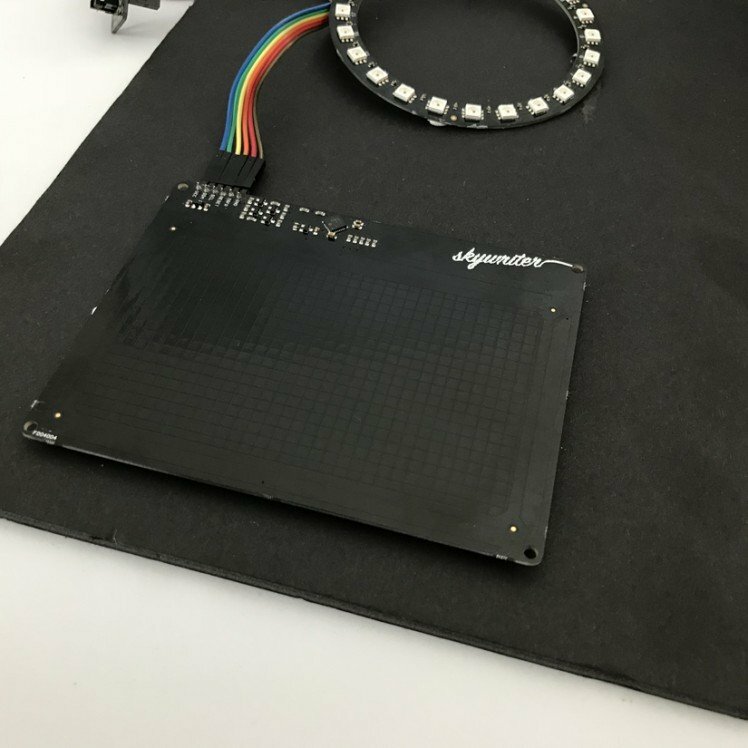 It can even be mounted behind a sheet of non-conductive material, like acrylic or fabric, and be completely hidden inside a project. Full Python (for Raspberry Pi, all versions) and Arduino libraries. I duplicated my complete code from ring.py into a file called flick.py and made the main bulk of the script a function called startspin(). The code had to be adapted to allow the user to flick either way and to spin the LEDs respectively. This was quite a challenge and, if you are interested, I suggest you look at the code as it involves three sets of if/elif statements to alter the startspin function based on the swipe direction delivered to the function from the skywriter class. The @skywriter.flick() detects the flick and triggers the startspin() function. However, I noticed a problem that the Skywriter class keeps listening for flicks and will continue to run the function over and over for flicks it detects while a spin is in progress. To overcome this, I made it first look for a double tap using @skywriter.double_tap and only then run the startspin() function based on the flick. It still isn’t perfect, but corrects the problem sufficiently. A neater solution would require some work on the skywriter class, adding a method to stop or pause in looking for events. This is something that has been requested on the Pimoroni forums and they have said they will add it as time permits. All my code is on my Github account below. It has been a great little project and I would like to make a housing for it as the gesture control is quite magical when hidden behind a surface. Web Developer / Digital Designer / Film Maker / Photographer / IoT Dabbler / Raspberry Pi Tinkerer / Linux Convert / Python Fanatic / Making and breaking, dismantling and head scratching.